State troopers in Nebraska are going to soon embark on a new way to keep the highways safer shortly. 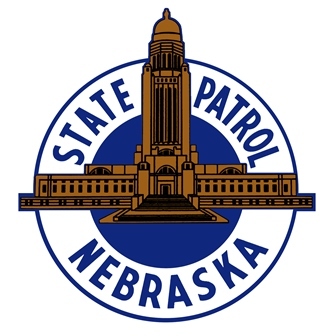 While law enforcement and operators holding a truck driving job often work closely to ensure safety of all vehicles on the road, Nebraska State Patrol troopers and the Nebraska Trucking Association are planning on pairing up in order to prevent dangerous driving. On February 24, the NTA announced their plans for the collaboration between the two entities on social media platforms. According to the post from the NTA, “The statewide project is designed to identify and address unsafe driving behaviors in and around large commercial motor vehicles.” to complete this, the state troopers will join semi truck drivers in their cabs to receive a different perspective compared to that which they would see in a typical patrol car. While the paired teams will be looking for overall safety mishaps, NTA further specified that they would be looking for specific behaviors such as texting while driving, following other vehicles at too close of a distance, general speeding, and aggressive driving. One thing that will definitely separate these pairs from typical trooper vehicles is that if the trooper witnesses a driving infraction, they will not pull the offender over themselves, but will instead phone a close by officer in a normal parole car to then take care of the offender. 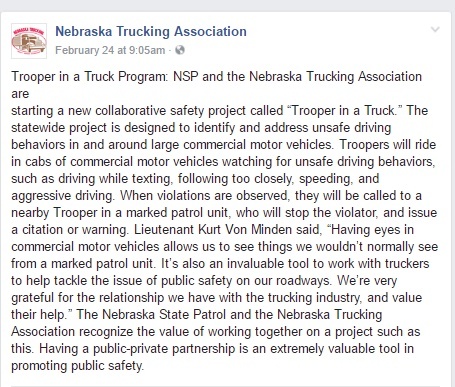 The post goes onto say that Lieutenant Kurt Von Minden said that the project will not only be beneficial to the state troopers of Nebraska, but also to truck drivers, as it will make them part of the plight to tackle unsafe roads. Almost all of the feedback on the upcoming program has been positive, with several even asking how it would be possible for them to begin to implement a similar program in their own state. What has not become clear, though, is just how this partnership will play out, as it could be likely that semi truck drivers, who more often than not work alone, would not wish to drive along with a state trooper. However, Lieutenant Von Minden already has a plan on how the partnership will work. According to Minden, they will run this trucker job side of the operation much like they do with airplanes, which has been something the department has utilized since 1946. According to Nebraska's state patrol website, their current aerial system works almost daily to assist in speed enforcement, traffic violations, rescue missions, general surveillance of areas, car pursuits, natural disaster relief efforts, and transportation. While it is beyond obvious many of these tasks will not be able to be accomplished by these paired trooper and semi truck driver teams, it is likely to help cut down on traffic violations. In recent trial runs that ran earlier in February, it was reported that a handful of tickets or citations were issued, but for the most part, gave them a better direction for making the program run more smoothly. Their next event is to be scheduled soon with their prospective running zone to be between Lincoln and Omaha along I-80. 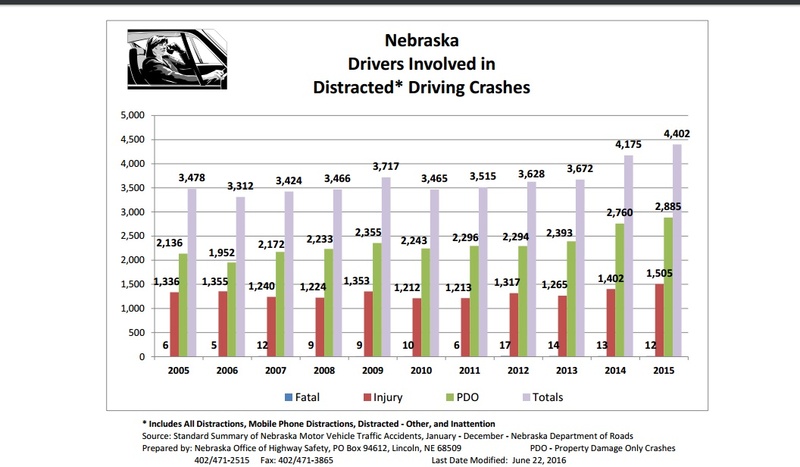 Much of this increased effort in trying to come up with a way to decrease traffic violations comes from the rising numbers of Nebraska drivers being involved in distracted driving crashes. In 2005 alone, there were 3,478 crashes due to distracted driving, with 1,336 resulting in injuries and 2,136 resulting in only property damage. Six of these distracted crashes resulted in fatalities in 2005. Five years later, in 2010, saw a slight fall in total number of crashes with a total of 3,465. However, there was also a slight rise in the number of property damage only crashes with 2,243 and also an increase in fatality crashes with ten. Sadly, the amount of distraction related crashes did not see any falls between 2010 and 2015 as they steadily rose, especially in 2014 and 2015. With the newest data available being that of 2015, there were a total of 4,402 distracted crashes – a rise of nearly 1,000 crashes. Distracted crashes resulting in injury also rose quite a bit with 1,505 while property damage crashes rose highly with 2,885 crashes. Sadly, fatality related crashes doubled within the ten years with 12 fatalities occurring in 2015 due to distracted driving. While this could be a great program, Nebraska is not the first state to try something of this nature. In November of 2015, the Ohio State Patrol and Akron police teamed up with Jrayl Transportation to do essentially the same thing, but this time seemingly more specifically for those traffic violations which occur close to a semi truck's proximity. At that time, 67 percent of crashes resulting in truck driver fatalities in Ohio were due to careless drivers around the truck. When the truck and patrol embarked on their two day quest, it only took them a few hours to already issue citations and tickets to 30 drivers for the same reasons Nebraska is trying to cut back on. Ohio also has a very similar program to the Trooper in a Truck partnership, but while this program is sponsored by both the Ohio State Highway Patrol and the Ohio Trucking Association, Truck Shield is a program that concentrates solely on training semi truck drivers assisting the Highway Patrol in seeing traffic violations. In the program which began in 2012, they learn how to recognize crimes that may occur along the highway and also how to accurately reach members of the force to put troopers in the area quickly. The crimes Truck Shield focuses on are a little more serious than the Trooper in a Truck program, with violations including drunk drivers, general crimes, homeland security, and human trafficking. What is also interesting about this program is that it does not have the same area of coverage as fleets and private semi drivers can contact the Ohio highway patrol in order to sign up for the program. Another state which has adapted the program to stop reckless driving around semi trucks is Mississippi. Their program is more of a combination effort of the two programs and called the Motor Carrier Apprehension Program. With this partnership, like with that in Nebraska, a Mississippi Highway Patrol person joins a driver in their semi to stop traffic violations. Also much like the Nebraska program, there is a set radius of miles they cover, which in this case is around nine miles. This Motor Carrier Apprehension Program is also close to that in Ohio, as it more closely tries to prevent violations relating to those which may cause harm to semi trucks including using no turn signal, slamming on the breaks, and following too closely. However, like the Nebraska Trooper in a Truck program, it falls on the trooper to call in the violator in order to dispatch a close trooper equipped with a patrol car. Other states such as California and Texas are said to be currently reviewing this program to see if it meets the needs of their respective state safety guidelines and how feasible it is with the sheer amount of trucking job opportunities in the states. This program saw impressive results of combating violations in 2013 as they issued 692 citations and 700 tickets within the counties which had the largest numbers of semi truck related incidents. Another interesting aspect of this program that differs from both of the others is that while the truck drivers and fuel is provided by the trucking companies, the money comes from a grant from the Federal Motor Carrier Safety Administration, amounting to an impressive sum of $400,000. One recommendation that has been mentioned again and again to passenger vehicles is to give semi trucks and drivers their space. It has been said by several states and their troopers to give a “buffer zone” of 200 feet in front and behind trucks in order help prevent a crash from occurring. One source said that this may seem like a lot of room between a passenger vehicle and a semi, but it also provides the correct amount of space between any vehicle to guarantee the semi has ample room to stop before it collides. Many have also mentioned that the possible two minutes a passenger vehicle may save without providing a good amount of room behind and in front of a semi is not worth risking their own lives, and definitely not others. While the Ohio Trooper in a Truck program, the other program mentioned in Ohio, and the Motor Carrier Apprehension Program offer little further information about the current state of their programs, it becomes obvious that these programs have continued to become popular in recent years. The biggest complaint among people have not been by troopers or truck drivers, but by passenger vehicle drivers who complain that this ride along program should be considered entrapment. However, the most legal definition of entrapment would be a member of the law enforcement agent who, “...induces a person to commit a crime he or she is not previously disposed to commit.” This would not pertain to highway patrol members considering the traffic violation would most likely still occur regardless if there was a law enforcement member being in the semi or not. While some may not agree with the implementation of one or any of these programs, especially in states with a large and complicated freeway system such as Florida, but it is an interesting way to keep the roadways safe for truckers.